Carlow Nationalist — It was children versus robots at IT Carlow! » It was children versus robots at IT Carlow! It was children versus robots at IT Carlow! HUNDREDS of children from across the county got to design and make robots at IT Carlow when they took part in an exciting robotics competition. They took part in the VEX IQ Challenge robotics competition, with youngsters from five Carlow schools awarded for their design and technological skills. 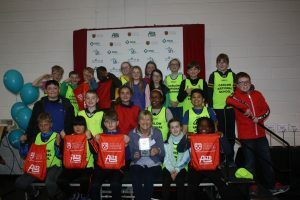 The talented children from Green Road NS in Carlow and St Finian’s NS, Garryhill won first prizes, while pupils from the Gaelscoil in Carlow town were runners-up. St Fiacc’s in Graiguecullen won the STEAM poster competition and Leighlinbridge National School was another runner-up. VEX Robotics is an engaging programme that facilitates school children between the ages of eight and 18 years to learn about STEM subjects. As part of the programme, they design, build and programme their own robot, which they then use against other school groups in the VEX IQ Challenge. Last October, 18 primary schools from Carlow, Kilkenny, Laois, Kildare and Wexford received their own robot kit, which was funded by Science Foundation Ireland. They all spent weeks and months learning how to design and programme robots before finally taking part in the VEX IQ Challenge. The event, which involved some 800 school children, was run in association with sponsors MSD and Autolaunch Ltd.
By its nature, the study of robotics inherently incorporates all four pillars of STEM – science, technology, engineering and maths. VEX IQ is a snap-together robotics system designed from the ground up to provide an opportunity to future engineers of all skill levels to engage and learn.